"Money is fungible" at Planned Parenthood: Not actually true. 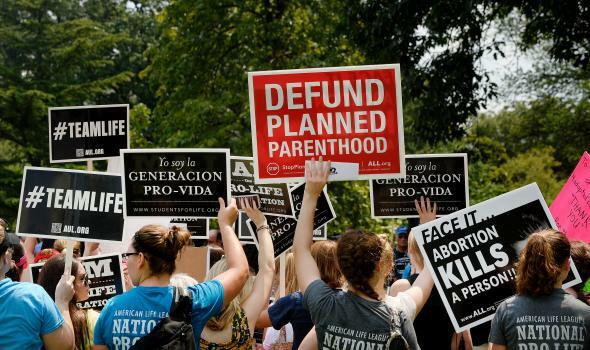 Republicans Say “Money Is Fungible” When It Comes to Planned Parenthood. It Is Not. Anti-abortion activists hold a rally opposing federal funding for Planned Parenthood in front of the U.S. Capitol on July 28, 2015, in Washington. Imagine you are in line at the grocery store. The customer in front of you buys a can of beans with a SNAP card. You buy a bottle of wine and pay with cash. Then the next person in line angrily accuses you of wasting taxpayer money by buying alcohol with food stamps. You’d probably be confused. The argument against you is that because the grocery store accepts food stamps from some customers, and because money is fungible, then you, by osmosis, have paid for your wine with food stamps. Sounds stupid, but that’s the exact argument that Republicans are using against Planned Parenthood. Some congressional Republicans are threatening a government shutdown in order to cut off federal funding to the women’s health care provider. They want you to believe that this is about abortion, but the problem is that the money in question goes to the wide array of preventive services that Planned Parenthood offers—from contraception to cancer screenings—that are not abortion. Since contraception funding remains popular in the U.S., Republicans have been pushing the “money is fungible” line, most recently used by Rep. Jim Sensenbrenner in an anti–Planned Parenthood congressional hearing. It implies that while Planned Parenthood is supposed to be getting money for contraception, it’s actually going to subsidize abortion. The problem is that it doesn’t work that way. To understand why, it’s useful to take a look at how Planned Parenthood operates and where its money comes from. The most important thing to remember is that Planned Parenthood clinics operate like any other medical clinic. A patient comes in, gets some services, and is billed according to what services she got. Some patients are eligible for federal money to offset the costs of some services. This works in a couple of different ways. For patients who are on Medicaid, the process is the same as with any insurance program. The patient’s bill is sent to her insurer, in this case Medicaid. They pay for any services that are covered and she is on the hook for the rest. Since Medicaid does not cover abortion, any Medicaid patients who get an abortion have to pay the price in full, in cash. Many conservatives have argued that Medicaid patients should simply go elsewhere for care. The problem is that many private doctors will refuse to take them on, because Medicaid reimbursements are so low. Planned Parenthood, being a non-profit, is more open to helping Medicaid patients. Title X funding is a little trickier, because it is given as grants and not reimbursements, but works in roughly the same way. If a patient falls within the Title X income parameters, the clinic is able to pay for part of that bill with Title X funding. In this way, low-income patients can get, for instance, a pack of birth control pills that would normally cost $50 for $10. They can’t obtain abortions in the same way, as Title X funding cannot go to abortion. Republicans who tout the “money is fungible” line want you to imagine that Planned Parenthood draws on one big pot of government money for all its services. But since medical services are billed and funded individually, that’s not actually how this works. For instance, if subsidies that discount contraception disappear, the price of contraception goes up, but the price of abortion will stay the same. We know this because recent experience shows it. A few years ago, the price of some birth control pills at Planned Parenthood and other family planning clinics suddenly skyrocketed, because drug companies jacked up the price they charged non-profits for the pills. Faced with growing expenses to provide contraception, clinics charged more for contraception, often seeing costs soar to two or three times what they were before. But during this same time, the price for an abortion stayed the same. That is because, despite the endless repetition of “money is fungible,” it is not. You cannot cut off subsidies and discounts for contraception in hopes that will drive up the price of abortion. It might make abortion more common, because women will have a harder time obtaining contraception, but it won’t make it any pricier.